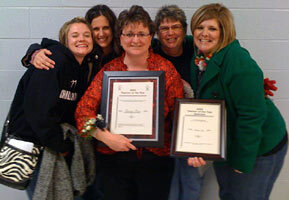 CAPTION: Tammy Price, 5th grade teacher from Central School (fourth from left) was named the 2009-2010 Teacher of the Year Friday afternoon, December 11, during an awards ceremony held at the Chillicothe High School. Others nominated for the award were, from left: Dorlene Meneely, high school; Vicky Duckworth, Grand River Technical School; Doug French, middle school; Jenny Hill, Field School; and Linda Fox, Dewey School. 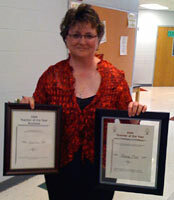 Central School fifth grade teacher Tammy Price was honored as the 2009-2010 Chillicothe R-2 Teacher of the Year during an awards ceremony Friday afternoon in the Chillicothe High School commons area. As the 2009 Teacher of the Year, Price wins $1,500 cash and $1,000 for education items to be used within the classroom - prizes financed by the Chillicothe Education Foundation. In presenting the award to Price, Superintendent Dr. Linda Gray Smith told the crowd of teachers, staff and administrators a little about her. Smith stated that Price has taught for 18 years, and 14 within the R-2 school district. She earned her bachelor of science degree from Missouri Western State University and a master's degree in education from Northwest Missouri State University. Smith read a portion of the nomination recommendation submitted on Price's behalf. It said, "Tammy states, 'My parents are the primary reason I am a teacher. They taught me the importance of an education and never allowed me to doubt the fact that I would go to college, graduate, and get a good job that I enjoyed. Both my parents worked long and hard to see to it that I had the resources to go on to college after high school. They instilled in me a passion for learning. What better way to continue that passion than sharing it with others by teaching.'" 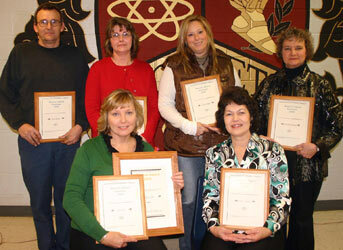 Other teachers nominated for the award were: Linda Fox, representing Garrison and Dewey Elementary Schools, Jenny Hill, from Field Elementary School, Doug French, from the Chillicothe Middle School, Dorlene Meneely, from the Chillicothe High School, and Vicky Duckworth, from the Grand River Technical School. Teachers nominated for the award receive $500 cash and $1000 for education supplies, equipment, or professional development, also financed by the CEF. 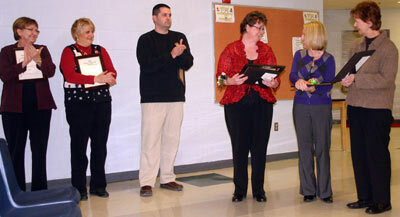 Also during the awards' ceremony, the 2009-2010 Beacon award was awarded to Lesa Lee (seated front row left), a para-professional at Field Elementary School. As the winner, she received $300 financed by CEF. Others nominated for the award are fellow support staff members: Janice Hamrick, Grand River Technical School (front row right); and (back row from left) John Knouse, Central; Marcella Murray, Dewey; Debbie Shafer, CHS; and Laurinda Davison, CMS. They received $100 each from the CEF.